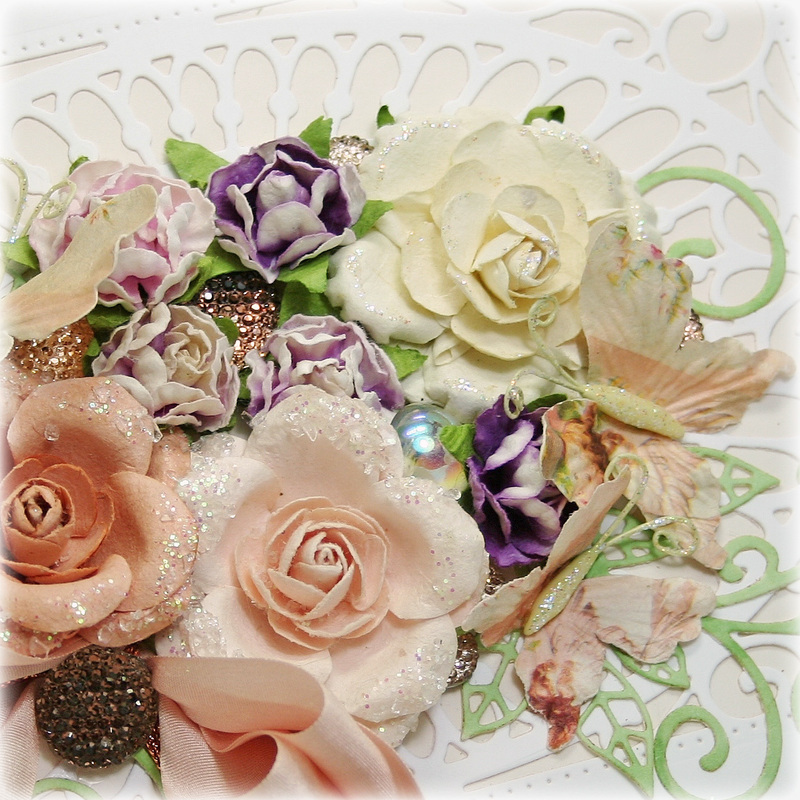 Dies R Us: Roses and Butterflies and Dies -- Oh, My! Hello, friends! Now, don’t fall over, but I made a box to share today. I know – shock -- something other than a card (my favorites), but this big, beautiful Sue Wilson die cut just begged to cover a box top. I would have preferred to alter an existing box, but a box of the right size did not exist in my alterables cupboard. This box measures 5” x 7” with 1 1/2” sides. In fact, if you haven’t browsed Sue Wilson dies, just click on the Sue Wilson Designs category at Dies R Us and prepare to swoon. 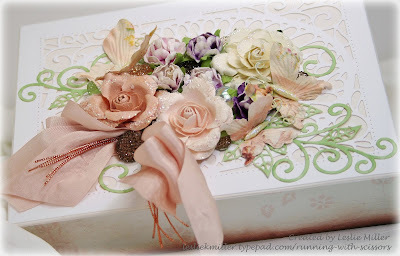 The flowers and butterflies are Prima, and I tucked in a few sparkly elements along with silk ribbon and copper cord. The leafy, swirly, twirling vinery was cut in white and then colored with a green Copic marker. I’ve found I like the idea of cutting new dies right away, even when I have no immediate plans for them. They’re SO much prettier cut and ready, and then I’m quickly inspired to create. If desired, I can color my die cuts with markers or perhaps brayer ink over them, or simply leave as is. Most of us love that white on white look, anyway, don’t we? Maybe cut some in white and some in ivory and just pile them up, ready to use. What fun! Enjoy your week, and thank you so much for joining me today! What a great idea to use this die cut as a box top background. BEAUTIFUL creation! This box is beautiful enough to be the gift! Anything you put inside it would be just an extra treat!